Jack Heffron, the author of this book, is a freelance writer, editor, actor, and teacher. 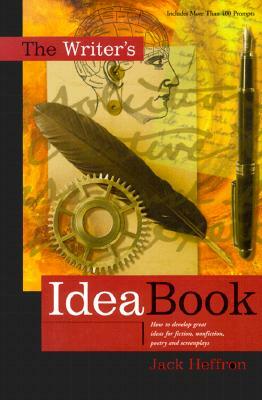 In this book he has created a resource that will help writers to jump start their writing by developing ideas from the more than 400 prompts. According to the author writing is an act of hope, courage, joy and celebration. Writing must be approached with a sense of play, of risk and experiment, openness and laughter. You should have fun when writing. The book is divided into four sections, each geared toward a different stage of writing, offer dozens of unique approaches to unleash your creativity. All the chapters contains prompts that will help you generate ideas for your stories, essays, novels, journal entries, etc. Part I (Bending and Stretching) contains four chapters—Making Your Way to Schenectady, Enemies of Creativity, Leading a Creative Life and Getting Ready to Write. This part is mainly concerned with the good habits that writers should develop like showing up (keeping a specific time to write), accepting the difficulty of creative writing process and learning to tackle it, making writing a habit or part of the daily routine, turning obstacles into opportunities, etc. It also describes the enemies of creativity—procrastination, talking, critiquing, judging, not enjoying the writing and not writing. According to the author, “Write regularly and you will find ideas flowing through you.” This section also talks about the topics like where to write (creating your own writing space), when you should write and how you should do it. All these things varies depending on the individual needs of each writer. This section helps the one that will work best for you. It also emphasizes the importance of taking chances and risks. The final chapter of this section deals with creativity techniques that will help you gain momentum. The techniques include free writing, brainstorming, automatic writing, listing, clustering, cave writing, cut and paste, mix and match, etc. Part II (Exploring) contains 13 chapters—I Yam What Yam and Other Lies, Schnitzel with Noodles, Nellie Malone from Fifth and Stone, With a Banjo on my Knee, Thought of a Sundrenched Elsewhere, What’s Your Road, Man?, The Love You Make, Don’t Get me Started, Your Fifteen Minutes, All Our Secrets are the Same, Minding other People’s Business, A Day in the Life of a Writer, and A Life of the Spirit. This part identifies the different sources—yourself, family, country, hobbies, likes and dislikes, relationships, emotions, other peoples interests, etc.—from where you can generate ideas for your writing and explains how to do it. It also offers numerous prompts to get you started. It is one of the most interesting sections of the book and will help you in writing many stories and essays than you ever thought possible. Part III (Finding Form) contains five chapters—Of Sonnets and Toasters, Fools Like You, The Shape of Thing to Come, It All Depends on Your Point of View, Other Rooms, Other Voices, Vast is the Power of Cities, It was the Best of Times, A Sort of Miracle. This part deals with choosing your form, how to create and develop characters, how to deal with space and time, how to tell the story, who should tell the story, ho to create great openings and endings, etc. Part IV (Assessing and Developing) contains four chapters—What’s at Stake, Sitting Still, Tell it Slant, and Anything is Beautiful if You Say it is. In this section, the author introduces the finer points of the craft of writing like adding details, introducing symbols, not telling everything, and so on. This is a book that is quite useful for a beginner. It gives a lot of practical advice and the prompts will help one find topics and generate ideas for writing and make writing a daily routine. A book worth reading and there are some real gems that will be useful for all.